Ever wanted to keep your solar panel in full sun all day long without having to constantly move it? A solar tracker may be the answer. This tracker has the advantage of being portable - if you move it, the tracker will automatically adjust back to the sun, unlike the chronological solar trackers. Another strong point of this solar tracker is its cost - there is no microcontroller or other expensive parts. To track the sun, this device uses 4 photoresistors arranged in a wheatstone bridge configuration. A quad comparator controls movement. One comparator acts as an oscillator to have the device turned on a small fraction of the time. 2 comparators 'decide' whether to yaw or pitch the solar panel, and the other comparator acts as an inverter. solar panel of your choice with mounting holes (I used a 20V solar panel, but as long as your solar panel is between 5V and 32V, you should be fine). If the solar panel is over 32V, you will exceed the maximum supply voltage to the lm324. If the solar panel is below 12V, you may need a 12V battery to power the H-bridge. 1 220uF capacitor (make sure the voltage rating is greater than or equal to the voltage of your solar panel. You only need 1 of these, even though the link shows a pack of 25). 4 2200uF capacitors. (make sure the voltage rating is greater than or equal to the voltage of your solar panel. You will need a capacitor with a higher voltage rating than this one if your solar panel exceeds 25V. You only need 4, but the link shows a pack of 20. If you want higher surge current capability, you can use all 20). 1 IRF3205 N-MOSFET transistor (comes in a pack of 5. You only need 1 MOSFET, but these puppies are fragile. I reccomend buying a pack of at least 2 in case you break one). 1 tactile button switch (This is a 10-pack. You only need 1). By using this optional switch, you can turn on the H-Bridge at any time without having to wait until the oscillator signals to turn on. Drill pilot holes for the 2" wood screws as indicated by the red marks in the picture. Any other holes in the picture do not need to be drilled. Drill pilot holes for the 2" wood screws as indicated by the red and green marks in the picture. The distance between the green holes should equal the distance between the red holes for wood1 as they should line up. Drill pilot holes for the 3/4" wood screws as indicated by the red marks in the picture. Drill holes for the bolts as indicated by the green marks. If the bolts cannot fit their shafts entirely through the wood, you can drill holes wide enough for the bolt heads as indicated by the green marks in the 2nd picture of this step. The distance between the green holes should equal the distance between the mounting holes in the solar panel. Drill holes in wood4 for the 3/8" diameter dowels (wood6) as indicated by the red marks. The dowels should fit snugly. Drill pilot holes for the wood screws about 1" deep in each piece of wood4. These holes should line up with the holes marked in red that were drilled in wood2 (step 3). Drill holes in the centre of each block of wood5. The dowels should fit the holes loosely. Drill a hole for a bolt through wood7. Then drill 8 small holes for the photoresistor leads. Make sure these holes can surround wood8. These small holes are grouped 2 per photoresistor. When you drill these holes, insert a photoresistor in each pair of holes. You can use glue to secure the photoresistors. Glue wood8 to wood7 as shown in the picture. Screw in a wood 5 piece at each end of wood3. Use the 3/4" screws. Use 2 nuts and 2 bolts to attach wood3 to the solar panel. Push the bolt through wood7 and a solar panel mounting hole. Thread on a nut and tighten. Now check everything attached to the solar panel. It should look like the 2nd picture (minus the wires). Twist one of each of the photoresistor leads together as shown. Twist long (approx. 18") wires to each of the remaining leads as shown. Line up wood4 with wood2 as shown in the picture. Screw the pieces together. Repeat with the other piece of wood4 at the other end of wood2. Line up the hole and screw together. The base has been made. Line up the hole in wood5 to the hole in wood4. Then push a dowel through. The solar panel should be able to pivot freely. Tie a string through a mounting hole in the solar panel. Tie the other end to the shaft of the motor and wrap it around. Use 2 of the 3/4" long screws to attach the H-bridge to the base. You may need to drill pilot holes. Unzip the .zip file and there is a fritzing file of the schematic and breadboard view. There are also jpg images of the schematic and breadboard views. If you don't have fritzing, download it. Be sure to use the male-to-female wire to connect the breadboard to the H-bridge. Also, the geared motor that is attached to the base is called "pitch" in the schematic. The motor of the rotating base is called "yaw". Make sure the solar panel can pivot about the dowels without hitting the breadboard. Simple as that. Be sure you connect the wires from the turntable motor to the H-bridge. The turntable motor is labeled "yaw" in the fritzing schematic (step 19). Congratulations! You have completed the project. Send me a message on Instructables if you have any questions or suggestions. Sir ,I have tried this project but my circuit is not functioning ,can you please provide me the clear cicuit diagram of this dual axis tracker . Thanks. Did you build one and get it to work? I have always had trouble with the baseplate rotation and I took mine apart. I built the circuit exactly as it was down on Fritzing, but it doesn't appear to operate correctly. Has anyone actually built this and gotten it to work? Specifically, what is the problem? Is power appearing to be supplied? Sorry for the delayed response. I had disassembled the circuit before you replied and I wanted to reassemble it before replying so I can be as detailed as possible. I reassembled verifying and reverifying each placement in the board by removing each piece from the breadboard view as I physically placed it into my breadboard. I also double-checked by disabling the parts view and alternatively the wire view to verify that I placed everything in the right place. When power is initially placed on the circuit, nothing noticeable takes place. Left/Right motor does not spin counter-clockwise under any test applied to my circuit. Hopefully you can spot my mistake if I placed a part in the wrong location. Also, What is the function of the momentary switch supposed to be exactly. I am not sure I understand the circuit that well to know what it is supposed to do. Thank you for your assistance and time. I truely appreciate it. The way you described the operation, there are no problems. What you call the Left/Right motor, I will call the yaw motor. The term "Left/Right" motor is misleading because that motor can only turn in 1 direction. If you are in the Northern hemisphere, the yaw motor should only turn clockwise (looking down at the tracker). If you are in the Southern hemisphere, the yaw motor should only turn counter-clockwise. As long as the motors are rotating in the correct directions (given your description, and assuming you are in the Northern hemisphere, they do) there is no problem. The circuit was not designed to allow the yaw motor to turn in both clockwise and counter-clockwise directions for simplicity's sake - the Sun will not unexpectedly change directions as it moves across the sky (hopefully). The disadvantage of this is that at the beginning of each day, you will probably have to manually turn the tracker to its initial position. "1 tactile button switch (This is a 10-pack. You only need 1). By using this optional switch, you can turn on the H-Bridge at any time without having to wait until the oscillator signals to turn on." 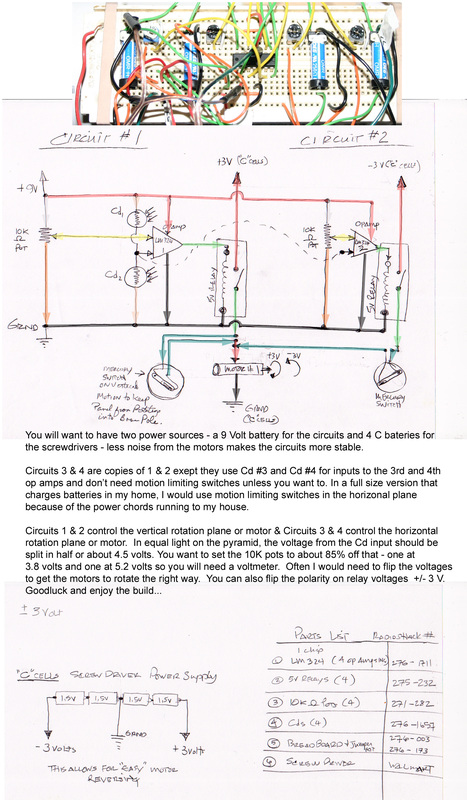 The circuit should make the motors move for a brief "burst" every several seconds. The button is there so you can press it without having to wait to see if the motors are moving in the right directions. Other than that, the button has no purpose and may be eliminated. oh. I understand. I misunderstood its operation. The design I am using this on has two motors that turn a threaded rod. Granted one of the axis will not move very often; however, I do want it to adjust to have the panels face the sun directly every time. Its been a very long time since I was in electronics basics class, so I am quite clueless on the design of what I am looking for. I can, however, follow a schematic. Do you think that it would be possible for you to modify this circuit design so that both axis respond to the light source? and if so, would it be possible to still use the same quad amp and motor driver? I can't seem to find a design that will manage two axis anywhere online . The problem is that I don't want it to have a separate power source. That is redundant. I like that I can use the power from the panel/battery bank to supply the voltage needed for your circuit. and connect the output of the op-amp to the open terminal of the resistor. The transistor (not included in the design from YouTube) amplifies the current from the op-amp to drive the relay. I would recommend modifying my design over the YouTube design since I understand how mine works better. Are you wanting the yaw motor to be able to rotate in both directions? If you want to modify my design to get that capability, you would need to have an additional op amp, requiring a total of 5 op amps (which would require another lm324 quad op amp chip). I'll post a picture of the modified (but untested) schematic in a few days, if you want. Does the tracker needed power to works? Yes. Look at the schematic(https://www.instructables.com/files/orig/F8B/45QZ/HJKC7VE8/F8B45QZHJKC7VE8.jpg). There is a power source labeled Vcc1 3V, but I used my 20V solar panel. I had to label it 3V because I couldn't find any 20V power source in Fritzing. Also from step 1, "solar panel of your choice with mounting holes (I used a 20V solar panel, but as long as your solar panel is between 5V and 32V, you should be fine). If the solar panel is over 32V, you will exceed the maximum supply voltage to the lm324. If the solar panel is below 12V, you may need a 12V battery to power the H-bridge." yes. I had another question is what if the battery is out of juice will the tracker still be able to function? There is no battery. The tracker is powered by the solar panel (the same solar panel that is mounted on the tracker). Whenever the tracker moves, usable power output from the solar panel drops, so making the tracker battery powered might be a good idea. which mean if there is no sunlight available and the battery ran out of juice, the tracker will not be able to function when we required to tracker to track sunlight. erm.. for example there is sunlight on the right and the solar panel is facing to the left does that mean it will not be able to move because the battery is out of juice and its facing to no sunlight direction? The photoresistor on the left is in the shade. The circuit interprets this information and tells the tracker to rotate the solar panel (along with the photoresistor assembly) in such a way that all of the photoresistors are in direct sunlight. In short, if the sun is not shining directly on the solar panel, the tracker doesn't know which way to turn since all photoresistors are in the shade. However, the diffuse sunlight should still be able to power the tracker.